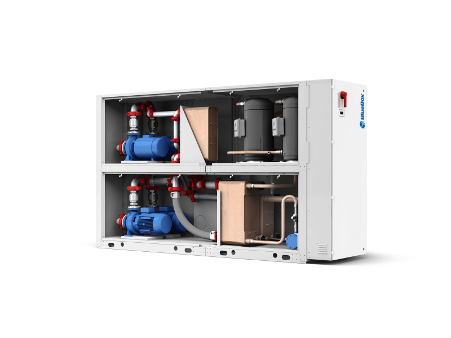 Water-cooled indoor chillers with free-cooling functionality constitute a unique solution by Blue Box. Suitability for systems where glycol mixtures are not used also with a benefit cost-wise. Plug-and-play process from selection, specification, sourcing to commissioning: this model integrates the chillerand the free-cooling sections; each system can be easily completed with the dry-cooler. Pump modules can be selected as well. The built-in control performs fully integrated management of such sections, maximizing the energy efficiency in each working mode: chiller, total free-cooling, or hybrid free-cooling mode. Two different levels of total free-cooling temperature selectable, to match climate profile with savings. The chiller section itself features outstanding efficiency, both as EER and as part-load / seasonal values. Indoor installation allows to comply with architectural constraints. Instead of on-site assemblies, one integrated unit exploits the reliability of a rigorous industrial process, comprising end-of-line set-up and testing.